Police have been accused of having a "defeatist attitude" after not trying to retrieve stolen goods which have been tracked down by their owner. 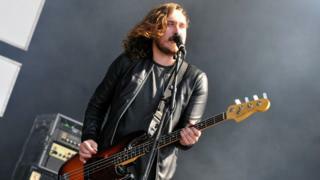 Rock band Mallory Knox had personal and electrical items stolen from their van while it was parked at Membury Services on the M4 in Berkshire. They traced a stolen iMac computer to an address in Slough, but say officers have made no attempt to get it back. Thames Valley Police said it had "no record" of the theft on its system. Band member Sam Douglas said laptops, iPads, clothes and other electrical equipment was stolen when the rockers had stopped for "10 minutes" at the service station on 31 August. Image caption One band member got a notification on his iPhone showing the location of his computer. Mr Douglas said he called the police, but they were "not much help". He added: "They almost had a bit of a defeatist attitude from day one saying 'oh it was Membury services, there's no CCTV there'." The band played a gig in Stevenage and were on their way to Torquay the following day when one member of the group got a notification on their iPhone to say their iMac had been connected to wifi at an address in Slough. After calling the police, the Cambridge group travelled to Albert Street, Slough, where the phone showed the iMac to be in a block a flats just 400 metres from a police station. Mr Douglas was told the police could not attend for an hour, and so flagged down two passing officers who looked around the area. "After 15 minutes they got called out to another call and they had to leave," he added. Mr Douglas said the band was advised not to enter the property to retrieve the items themselves, and added he had not had contact with police since. He added: "The last couple of days, it's more about me getting in touch with them, than them getting in touch with me."